Our dear friends, as we had told you in previous posts, The Veggie Sisters participated in an amazing food festival that took place in Athens a few days ago. It was a fantastic and delicious experience that satisfied our taste buds, our eyes, our nose and our hearts as well! We met people that share the same vision: they make amazing high quality products based on pure ingredients and traditional recipes and they promote Greek food culture. Louisa Armakola, from the Aegean island of Tinos, is one of them. She owns a small company that is called «Απ’το ντουλάπι της γιαγιάς». («From the grandma’s pantry»). Three generations (grandmother, mother and daughter) make a vast variety of handmade products using traditional methods: spoon sweets, pasta, jams, cookies, spreads and delicacies. We tried tasteful crunchy tomato rusks, artichokes in oil but our favorite product was artichoke garlic spread! It was mouthwatering! I made a potato salad with it and it was really yummy! The fact that out there there are many greek producers that keep tradition alive and make excellent products makes me really happy! Let’s move to our recipes! 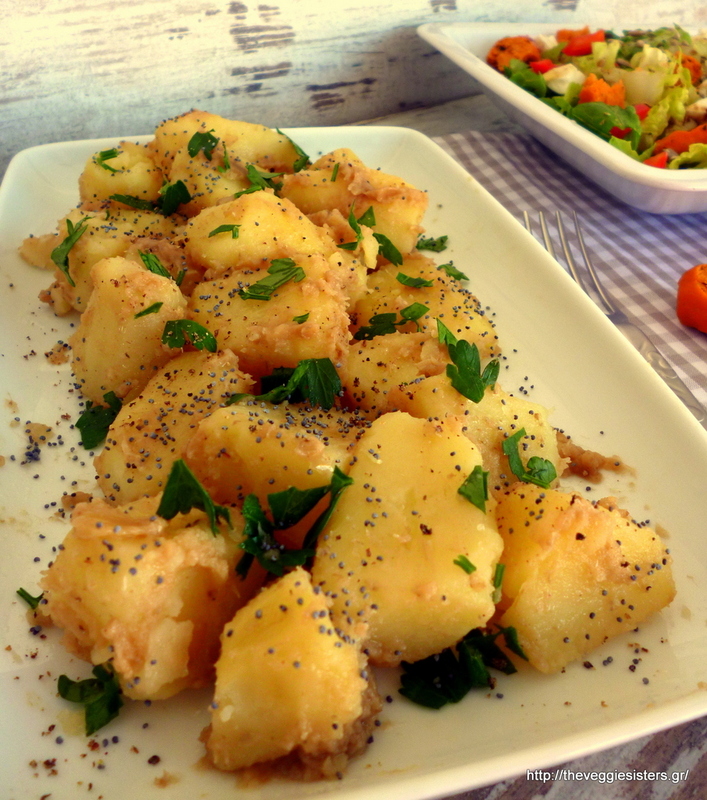 Place cooked potatoes while they are still warm in a bowl and gently add the artichoke spread. Mix to combine. Add poppy seeds, parsley and season with pepper. 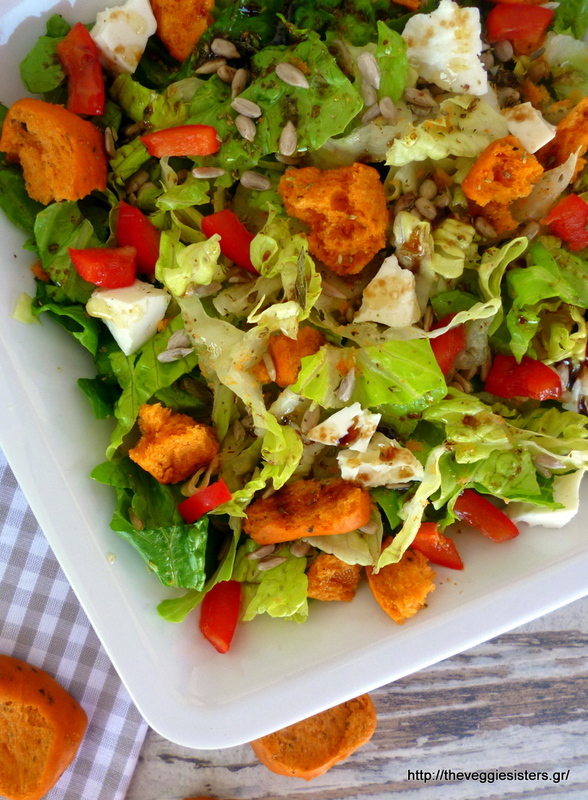 For the salad: just combine all ingredients in a dish and pour olive oil and balsamic cream. 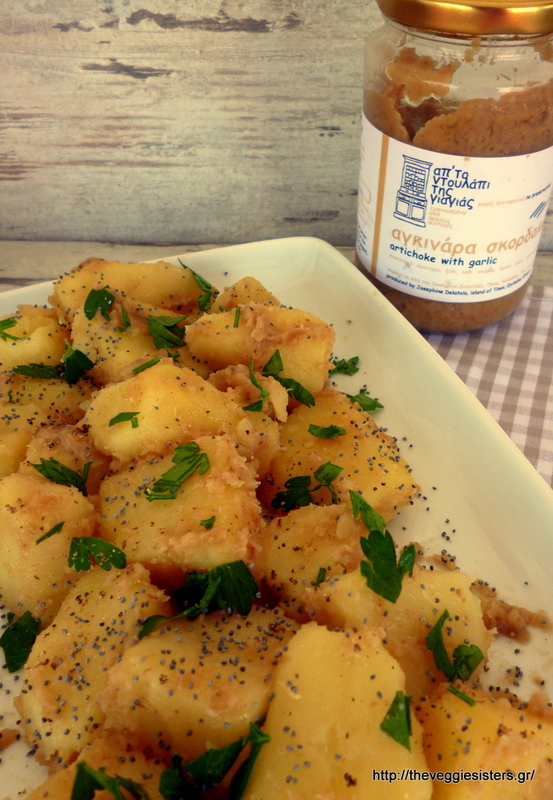 Enjoy a delicious meal from the island of Tinos! Share the post "Potato salad with artichoke garlic spread"